Bam! This dish is spicy, delicious, and packed with nutrients. 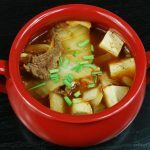 The zesty and high fiber kimchi, super spicy gochujang, and protein rich beef and tofu make this dish incredibly filling. Add the kimchi, hot pepper paste, black bean sauce, onion, and tofu to the crock pot. Set the crock pot to cook and let the hot pot simmer for at least two hours. I like to prepare the beef and stock the night before, and set it in the fridge over night. Before I leave for work the next day, I set the crock pot to cook so I can come home to a home cooked meal.